Hudson started his Be Someone non-profit organization in 2001 and has trained more than 64,000 young people how to fight with their brains not bullets. He speaks in terms young people today can understand and he has experience to back up his street-cred. “I grew up in the inner-city of Birmingham. I was destined to fail. My resume was not pretty…. Foster child, gang member, petty criminal,” he says. 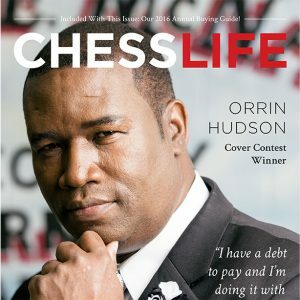 His life changed forever one day when a teacher saw the potential Hudson never realized he exhibited and sat him down in front of a chess board. “At first I rebelled. I’m not smart enough to learn this game and even if I did, so what.” The patience of this teacher paid off and the “so what” came to be as Orrin slowly gave up the street life to turn things around. “I honestly believe my teacher using the game of chess not only changed my life, he saved it,” Hudson claims. Several years removed from his high school days and well on his way to a successful life, Hudson saw a story about a New York robbery resulting in the murders of several young people. He knew then he had to do something to pay back the debt he owed. 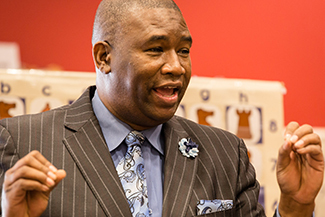 He developed a training program using chess aimed at young people – many of them at-risk youngsters – as well as parents, guardians and counselors. Hudson requests registration be made at info@besomeone.org and invites interested attendees to visit the organization’s web site at www.besomeone.org to learn more about him and his program. This is not his first visit to Chicago. He was here last year as part of the Disney team promoting the movie “Queen of Katwe” about a young girl who escaped her brutal life in a slum in Kampala, Uganda, after she was taught how to play chess. That changed her life just as it did Hudson’s.